July was good for the Butler Wobble. The Parades went well. Unfortunately a software compatibility issue wouldn't let Dave's iPod edit and share the video from the Emlenton parade. It was quite the experience. Next year, you'll have to join us to find out! If you read the banner above this entry, you'll see we're expanding our regular ride schedule. That's a result of some brainstorming sessions and conversations we had at NAUCC 2011. We want YOU to join us. 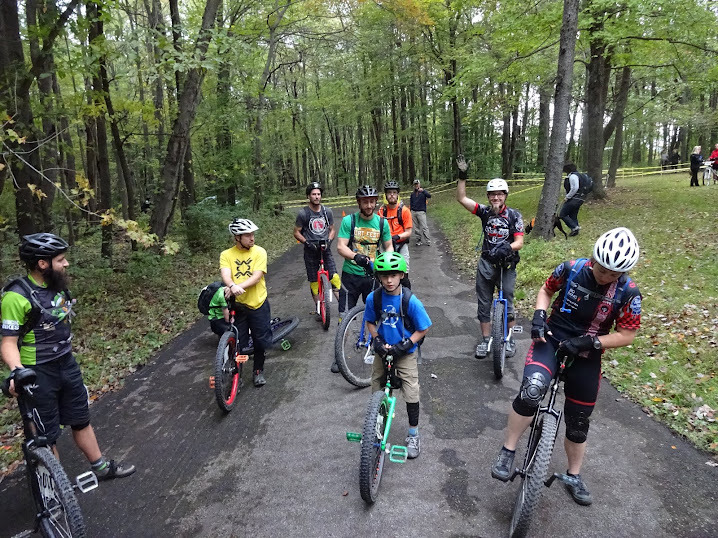 Unicycling is fun and for everyone. Speaking of joining us: we're looking to keep things even more up to date. The blog will have most of the info on it, but we've also opened a Butler Wobble Unicyclists group on facebook. It is a closed group, but we can get you in. We hope to be able to get more rides organized this way- and share more pictures. Can't ride yet? You've got options. We'll be back at the Butler Y on Saturdays from 4:30-6:30pm starting November 5th. If you can't wait that long, we're going to offer free lessons (outdoors) based upon interest and member availability. All you have to do is contact us and we can work it out. For those who can already ride and may be looking for a first, second, or 17th unicycle: we've got some loaners. Until we work out a good library system you can't keep them, but you're welcome to go on a ride with us and test a different wheel size. We've got some 24s, a 29 (but you may have to fight Lisa for it), and a 36 (THANKS JOHN!) that we can bring (in addition to a pile of 20's). Friday nights might be a good time to check one out. You'll have to contact us ahead of time to make arrangements. This all fits into our mid range plan: NAUCC 2012. At this point, it's scheduled for the Detroit area. That's pretty close for the National Convention and Championships. You should go. Isaac, Dave, and Lisa went this year. If you want to check out the results, here. That tells you about the competitions, but doesn't even give you half the story. The convention aspect was the most amazing part of the trip. Shorter term plans include MUni rides throughout the month of August. Why? - We have the Oregon for testing. We're riding tonight at 6, and sometime Saturday with more rides to follow. The Month of Mud is just around the corner. Keep checking back for more details, but most likely it's time to get your MUni on!